Supplier & Manufacturer of Manufacturing Preparation Plant & Ointment Manufacturing Plant. Our product range also comprises of Ampoule Washing Machine, Vial Washing Machine and Bottle Washing Machine. We are among the reputed names in the industry for manufacturing and supplying Ointment Production Plant. The offered plant is extensively used in pharmaceutical industry for the formulation of ointments and ensures compliance with the stringent parameters of hygiene. This plant is resistant to corrosion, non-abrasive and has a long service life. We have set a benchmark in the industry for manufacturing and exporting Cream Preparation Plant. The offered plant is used for formulating creams in a wide range of industries including pharmaceutical, cosmetics and food processing plant. This plant ensures negligible vacuum drop during mixing and blending of cream and compliance with highest hygiene standards during processing. Ointment Manufacturing Plant is an ideal tool for the pharmaceutical & cosmetic industries for the production of Ointment, Cream, Lotions, Tooth Paste & other emulsions & homogenizations. It is specially designed to take care of two critical factors which directly affects the quality of the Ointment/Creams. Minimum man handling of Ointment. Negligible vacuum drop during mixing & blending. Needless to say, it also provides the benefits of the effective manpower utilization. Material transfer pump to transfer material from manufacturing vessel or planetary mixer to storage vessel & storage vessel to Ointment (Tube) filling machine. Liquid Oral Manufacturing Plant is ideal tools for the pharmaceutical industry for the production of Oral Liquids. It is specially designed to take care of two critical factors which directly affect the quality of the Liquids. Minimum manual handling of Liquid and effective cleanness during manufacturing. 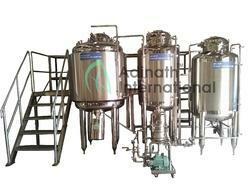 Adinath offers Syrup Manufacturing Plant capacity ranges from 50 Liters to 20,000 Liters. Water for Injection Plant is designed to produce sterile, pyrogen free distilled water conforming to U.S.P. / B.P. specifications. The still works on interstate heat exchange principle whereby the distillate is produced at a fraction of the cost as compared to single column stills. All contact parts are made out of AISI 316 quality and mirror polished. Syrup Preparation Plant is ideal tools for the pharmaceutical industry for the production of Oral Liquids. It is specially designed to take care of two critical factors which directly affect the quality of the Liquids. Minimum manual handling of Liquid and effective cleanness during manufacturing. 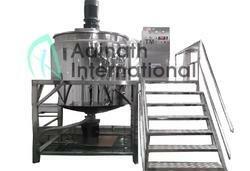 Adinth offers Syrup Manufacturing Plant capacity ranges from 50 Liters to 20,000 Liters. Water for Injection Tank is uses for the storage of Water for Injection in the pharmaceutical injectables. After the purification of purified water (WFI), engineering of the customer-specific storage and distribution system takes place, so product water can be delivered to each point of use in the sterile distribution system without recontamination. Here to we consider the customer's specific conditions and produce an individually engineered design. We provide WFI Storage Tank as per requirement of the customer. Vertical /Horizontal tanks are available in jacketed and non-jacketed design. The design is as per ASME standards.We manufactures WFI tank with jacketed design, where heating media is either boiler steam or electrical heaters. 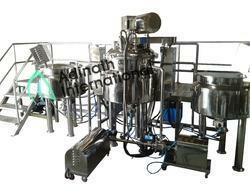 Lotion Manufacturing Plant is ideal tools for the pharmaceutical industry for the production of Oral Liquids. 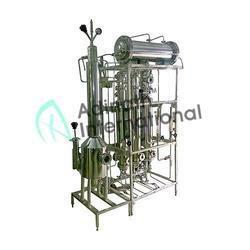 It is specially designed to take care of two critical factors which directly affect the quality of the Liquids. Minimum manual handling of Liquid and effective cleanness during manufacturing. 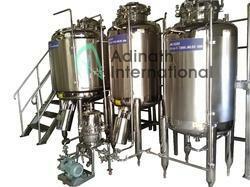 Adinath offers Syrup Manufacturing Plant capacity ranges from 50 Liters to 20,000 Liters. Toothpaste Manufacturing Plant is ideal tools for the pharmaceutical industry for the production of Oral Liquids. It is specially designed to take care of two critical factors which directly affect the quality of the Liquids. Minimum manual handling of Liquid and effective cleanness during manufacturing. Adinath offers toothpaste Manufacturing Plant capacity ranges from 50 Liters to 20,000 Liters. Gel Preparation Plant is ideal tools for the pharmaceutical industry for the production of Oral Liquids. It is specially designed to take care of two critical factors which directly affect the quality of the Liquids. Minimum manual handling of Liquid and effective cleanness during manufacturing. 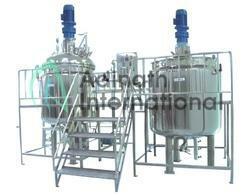 Adinath offers toothpaste Manufacturing Plant capacity ranges from 50 Liters to 20,000 Liters. GEL Preparation Plant is an ideal tool for the pharmaceutical & cosmetic industries for the production of Ointment, Cream, Lotions, Tooth Paste & other emulsions & homogenizations. It is specially designed to take care of two critical factors which directly affects the quality of the Ointment/Creams.